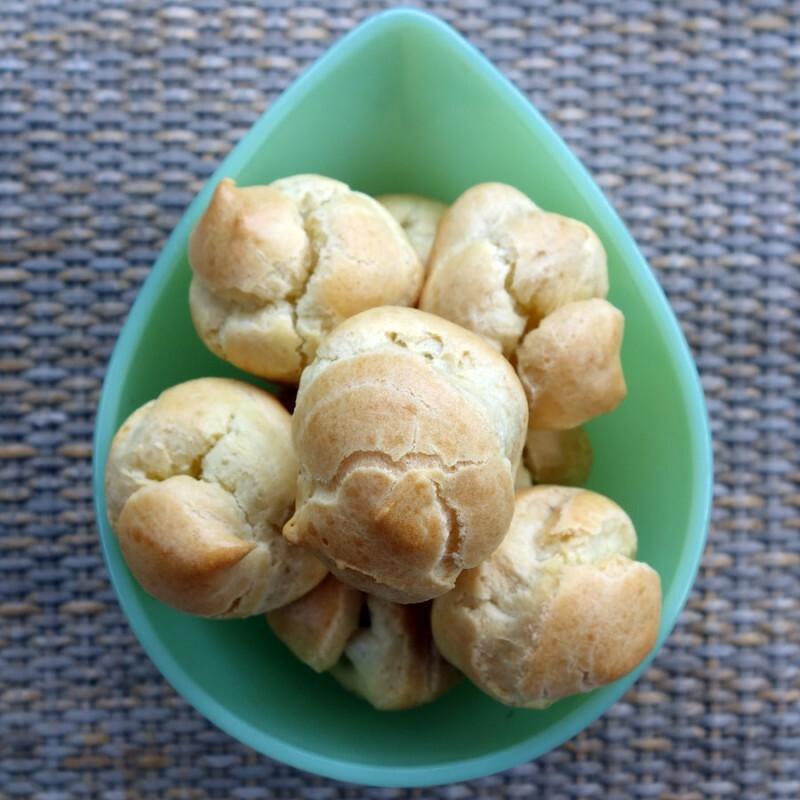 Choux pastry is used for making cream puffs, éclairs, and other hollow pastries that are filled with various savory and sweet fillings. Preheat oven to 425 °. Line two half-sheet pans with parchment paper or silicone baking sheet liners. Have ready, a stand mixer with the paddle beater attached or a bowl and an electric hand beater with the eggs nearby. In a small saucepan, combine the water, butter, sugar, and salt and bring to a boil. Add the flour all at once, turn heat to low and vigorously stir the mixture with a wooden spoon until it’s smooth and forms one ball leaving no residue in the pan. Remove the pan from the heat, pour the mixture into the mixer and beat at medium speed to cool it for one minute. Beat in eggs, one at a time, at medium speed, until they are fully incorporated. Place mixture in a piping bag and pipe 1-inch rounds that are about 1 inch high on the sheet pan, leaving about 1 1/2 inches between them, since they will expand. Bake for ten minutes, then lower the heat to 350 ° and cook them until they are light golden brown. Remove the pan from the oven and poke a hole in the side of each puff and return them to the oven for another five minutes to dry the insides. Cool on a rack. Fill as desired.